The second oldest cheese factory in the United States, the Plymouth Cheese Factory has been producing unique artisan cheeses for over 125 years now. Sure, that’s cool, but it gets better. This cheesemaker still occupies the same building, now owned by the state of Vermont, as it did in 1890 when it was built by John Coolidge… you guessed it, the father of Calvin Coolidge, our 30th President! This cheese has got some serious pedigree. Turns out, John Coolidge was a dairy farmer and he used the same recipe that the first European settlers brought with them to the New World to create Plymouth Cheddar. 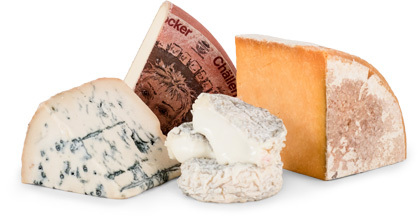 It’s the closest thing you’ll be able to find to the cheeses America’s first farmers produced in the 1600s. You’re about to taste history and you’re going to like it… a lot. Although cheesemaker Jesse Werner is making quite a few outstanding cheeses, we simply had to share their flagship cheese with you. It’s aged for 12 months and hand dipped in a bright red wax as the early settlers did. 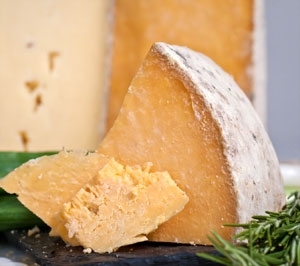 The cheddar flavor is an outstanding balance of sweetness and savory flavors. Many cheddars today are being made sweeter and sweeter, but this cheese is a step away from that trend. We feel Jesse has really captured the right balance of both acidity and umami flavors. Look for a big, brothy, savoriness, bold cheddar tang, and a gentle, fruity sweetness. It’s pretty versatile. You could serve it with salami or fresh fruits like apples or grapes, crumble it over warm pie or just add to a cheese tray and let it speak for itself. It will pair well with hoppy India Pale Ales and India Pale Lagers, Ciders, and Cabernets.